Main theme for the project: Acquisition of competences (knowledge, skills and attitudes) in order to improve personal development and employability. Support of the professional development of those who work in the field of youth in order to improve the quality of youth work across Europe. Project type: Erasmus+ Key Action 1. Mobility of Youth Workers. Youth Workers’ Training & Networking. Cost: Food and accommodation is FREE. Participants will be required to pay a participation fee of €40 (cash) at the beginning of the activity. Travel cost: we will cover the exact amount of your travel cost according to the receipts you will provide as long as it is not more than the amount foreseen by the European Commission. You can calculate the travel cost using the distance calculator supported by the European Commission http://ec.europa.eu/programmes/erasmus-plus/tools/distance_en.htm. Travel cost will be reimbursed on display of their boarding passes and receipts. Safety & Insurance: a responsibility of the participants. providing the individual participants with skills necessary to succeed both in youth activities and the workplace. To make it possible for Estonian successful Start-Up entrepreneurs to share their stories to inspire the participants. This training activity will be based on the Business Model Canvas, a popular strategic management and entrepreneurial tool. All working activities will aim at fostering intercultural learning and exchange between participants from diverse backgrounds. Methodology will include simulation games, role play, plenary debates, interactive lectures, audio-visual presentations, small and large group discussions, self- assessment and more. There will be field visits to Estonian Start– up companies and visits from successful young entrepreneurs in the training venue so that the participants will have the opportunity to learn from their experiences. With their participation in this capacity-building activity, the trainers and the youth workers will be able to strengthen and support their organisations to tackle social problems, to multiply the impact of youth work, to raise the visibility of their projects. 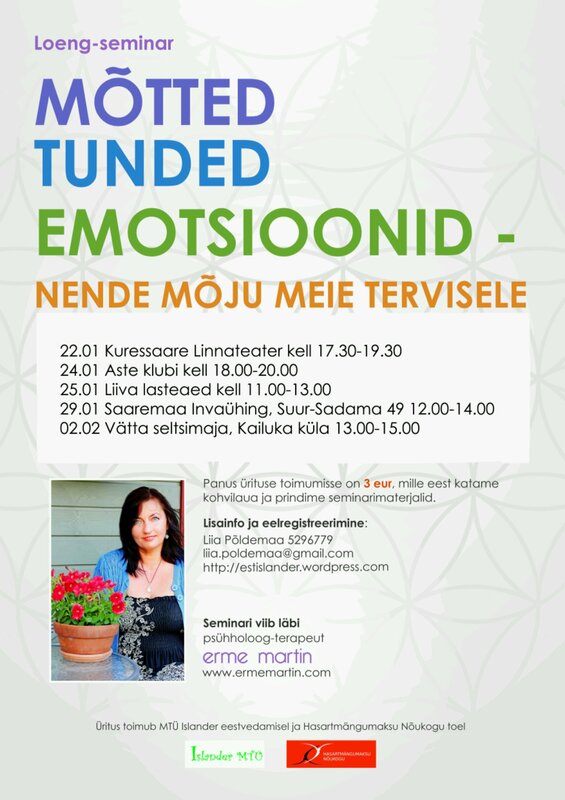 Projektitegevustena viime jaanuarist kuni märtsi lõpuni 2014 läbi 10 vaimse tervise alast loeng-seminari Saare-, Hiiu- ja Läänemaal ning 60 psühholoogi ja psühhoterapeudi individuaalnõustamist. Lisainfo toimumispaikadest tuleb õige pea! Soovime projekti tegevustega toetust pakkuda eeskätt väiksemate piirkondade inimestele, kellel on väga piiratud juurdepääs vaimset tervist toetavatele teenustele. Loenguid viib läbi psühholoog-terapeut Erme Martin. Tutvu http://www.ermemartin.com/. Panus ürituse toimumisse 3 eur –sisaldab ka kohvipausi. Üritus toimub MTÜ Islander eestvedamisel ja Hasartmängumaksu Nõukogu toel.